ABOVE: Screenshot the “fish market” negative mailer. From this tweet. Please take time to research candidates’ platforms and backgrounds on their websites (as recommended by the bi-partisan League of Women Voters). Political ads are designed to sway opinions with misleading information, don’t be tricked or influenced! Know the facts first. I live in the 3rd Congressional District in New Jersey (Burlington and Ocean Counties). The incumbent has been bashing his challenger with false, misleading, twisted, and downright racist ads on television and through the mail. Andy Kim has been portrayed as a “carpet bagger”, who travelled here just to win a seat in Congress, with no affiliation to this area. But Andy Kim grew up in Burlington County, in Marlton. He moved away for college/grad school and to work in DC, but moved back to New Jersey after the last election. At that time, he decided to run for Congress in response to the threat to affordable health care and protections for pre-existing conditions. Around the time of the last elections he and his wife had a baby boy with medical issues. Kim is a Rhodes Scholar, with a Doctorate in International Relations from Oxford University, who moved to DC when he started working in politics. He began working for the Republican administration in the last months of the Bush presidency, and continued for years under the Democrats and President Obama. Because he stated, truthfully, that he worked for both parties, he has been accused of “padding his resume”, with an “entry level job”. It is not like he was flipping burgers at McDonald’s! Kim spent two years at the White House as the Director for Iraq at the National Security Council. He was the point person for coordinating the counter-ISIS war. He served in Kabul, Afghanistan as a diplomat and strategic advisor to Generals Petraeus and Allen when they were leading coalition forces in Afghanistan. One ad claims that Kim lied and “was never in the military”, but he never claimed to be in the military! He advised for the military commanders on-site in Afghanistan. Kim also worked at the Pentagon, State Department, USAID, and on the Senate Foreign Relations Committee, yet he is portrayed as a “paper pusher”? The worst ads claim that Kim is a “tax cheat” and that he “doesn’t pay any taxes in New Jersey”. He has a very legitimate reason. Kim and his wife and 2 children now live in NJ and rent a house in Bordentown, while they still own their house in DC. Renters never pay property tax directly. Part of their rent is used by the landlord to pay property taxes. Renters are still tax paying citizens in New Jersey. Please make informed choices about candidates who support your priorities, and don’t be swayed by negative and misleading campaign advertisements. Make sure now that your voter’s registration is current and please vote on November 6th! 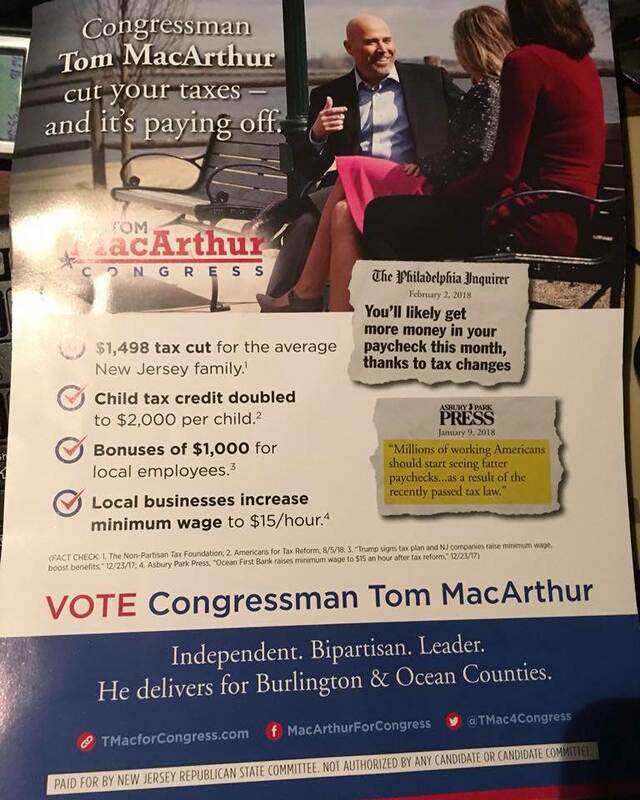 Screenshot the “fish market” negative mailer, opposite side. From this tweet and this tweet. Previous Post: OPINION: The Moorestown, NJ Board of Education is violating NJ’s Open Public Meetings Act.